Informant KM is a sophomore studying Chemical Engineering at the University of California, Santa Barbara. She is of Indian descent and moved to America at a very young age; however, she is very proud of her Indian heritage and considers herself to be very knowledgeable in regards to Indian mythology and religion. She is also fluent in two Indian languages, Hindi and Marathi. This piece of folklore is her recitation of a very common Indian folktale to me (AK). KM: Shivji and Parvati are married. Shivji is the God of destruction and one of the top 3 gods of Hinduism. Parvati is a big goddess and she’s an embodiment of the Indian God Devi. Parvati is showering and she wanted to be protected while she was in the shower, so she used the dirt of her skin to make Ganesh. And Gan, these men, are like little minion kind of looking things that stand outside the door, so Ganesh was standing outside the door. Then Shivji came, and it’s not really sure why and Shivji got really pissed and out of anger he cut Ganesh’s head off. Parvati got pissed, and she threatened to — like tear the world apart if Shiv doesn’t fix the situation. So Shivji went and decided to cut the head off the first thing he saw which was an elephant, and he placed it on the Gan’s head. AK: Woah… that’s a crazy story, anything else you wanted to add? KM: Yeah, actually what’s controversial about this story is that the idea of her taking the dirt off her skin was the product of adulteration, or it wasn’t Shiv’s child which was why he was so pissed. AK: Cool, similar questions again, where did you hear this story from? KM: I heard this from multiple people, my grandma, mom, dad, and I’ve read about it. AK: What does it mean to you? KM: I like this story because it shows people as flawed, even Gods. I personally enjoyed this story because I was very well acquainted with the God Ganesh, but I never knew his creation myth. For this reason, I thoroughly enjoyed this piece because I learned something very relevant to my own life. Obviously, I could have just researched his creation on my own, but it was very nice to hear the story verbally. The informant is Indian American. Her parents are both from India, but she was born in California. She’s not very religious, but she considers herself culturally Indian. When I asked her where she heard this story, she said “The story is from The Panchthantra, which is an Indian book of myths and stories, and I used to have a comic book version growing up.” So the story is clearly a folktale that was transcribed into authored literature, which then became many different versions, one of which was a comic book. It follows traditional oral tradition, the most prominent of which is only two characters in a scene. The monk only speaks to one person at a time. I think the message of the story is to remain humble. The young girl wants the most powerful husband in the world, but it ends up being a simple rat. And even then she cannot marry him unless she is reduced to her original state; so regardless of her transformation into a beautiful woman, and her wish for a powerful husband, she herself is humbled by her transformation and her final choice of husband. I think another message is that power is not where we’ll expect it, and there are many different forms of power. This tale is probably a good one to tell to children who become to over-arrogant. This joke mocks the rituals of Ganesh Chaturti, a traditional Hindu festival in which earthen idols of Ganesha are immersed in the nearest holy river or lake, symbolizing his return to his mother, the goddess of the earth Bhumi Devi, amid a spectacular celebration. It personifies the idol of the young, elephant-headed god, and switches the positions of the drowner and the drownee, putting Ganesh in the position of power here. In addition to this, the god is portrayed hilariously immature and vindictive, diminishing his deified dignity and showing him to be actually disgruntled by the rituals of a festival which celebrates his birth and ascent to heaven, a situation which people don’t really consider when performing these grand and honorific traditions. This is a Vedic proverb, which conveys a very Hindu ideal. The main purpose of the Hindu faith and its various scriptures, including the Vedas and the Bhagvadgita, is to teach people how to live a simple, honest, and fulfilling life. It accomplishes this through preaching moral values and highlighting the importance of a strong character (Dharma) over wealth (Dhana). In fact, one of the best ways to attain moksha, the ultimate state of being, where a person can be as close to the gods as possible, is by giving up all worldly attachments, including money, fame, and love, and focusing solely on living a simple, Spartan life that tests one’s willpower and devotion. Therefore, it would make sense for strength of character to take precedence over wealth in a society where such values form the backbone. Contextual Data: My family isn’t particularly religious, but my parents both grew up in India and they were raised in Hindu households, and so, over Spring Break, I asked my mother if there were any Hindu myths that she remembered particularly well—if there was one she wouldn’t mind recounting for me. The following is an exact transcript of a myth she told me about how Ganesh, the well-known elephant God, got his elephant head. 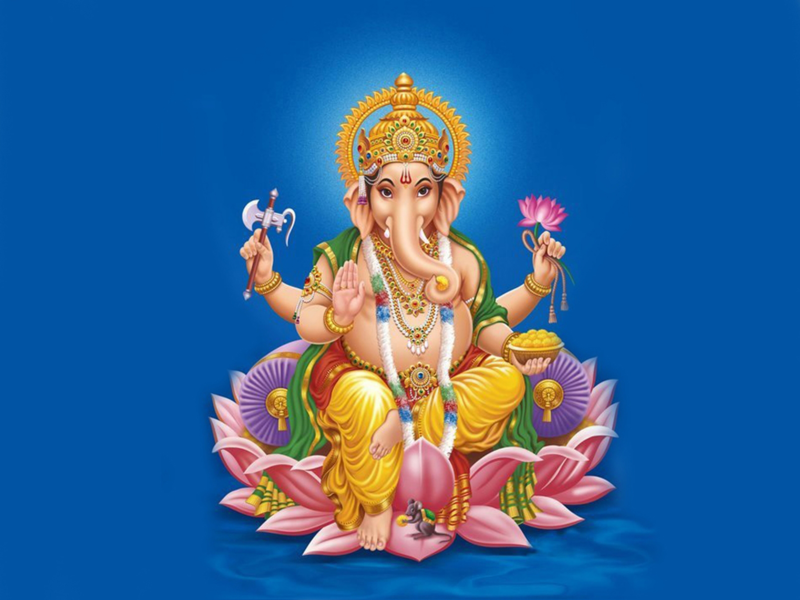 When I asked my informant about the significance of this, she said that it related to ideas of Ganesh as the “god of obstacles”—that he’s the figure in the Hindu religion that’s traditionally thought of as either introducing or removing obstacles from an individual’s life and from a family’s home. Many family’s hang up pictures of Ganesh as a way of honoring him and respecting these obstacles that he’ll either introduce or remove from the home. It also may speak to the perceived relationship of the son to the household—that when the father is away, he is meant to protect the household and act as a protector to his mother. When I asked my informant where she first heard this story, she mentioned that it was just something she kind of grew up with—it was everywhere. In India, these types of myths were often rendered in comic books, so she may have first either encountered it in one of these books, or heard it from her parents. For the most part, she says there’s little, if any, variation in this story. 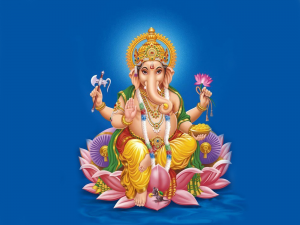 In general though, the myth is one that people in India tend to know really well because Ganesh is so meaningful to them and because the Hinduism is an important part of the culture in many regions of the country. This story has religious origins, but my informant views it as more of a folk myth; he did not learn it in a religious context. It is a well-known story for Hindus, but like many stories from major religions, it has spread beyond the religion itself. This particular story has a cultural relevance that would appeal to people of all faiths; the “respect your elders” message is one that resonates with very diverse populations. My informant postulates that Sri Lankans place more emphasis on the importance of showing respect to one’s elders than Western cultures do. Despite the underlying lecture his parents are delivering when they tell him this story, my informant is aware of what makes it enjoyable for him. He likes the humor and the relatability of the main character. Even so, he is able to appreciate the deeper meaning and the lesson his parents were trying to teach him. **For an audio recording of this story, listen to Ganesha Walks Around the World by Jai Uttal. It is a published version of this same story recorded in an audio version.